The Chinese government - Hikvision's controlling shareholder - is increasing its ownership of the video surveillance giant amid sharp stock price declines, the US considering sanctions, and Hikvision's president saying they are focusing on survival. In this note, we examine this move and how sustainable such a strategy is given unprecedented scrutiny over Chinese government influence in video surveillance. This was not only because of Hikvision-specific factors like decelerating sales growth, the NDAA ban, and possible sanctions, but also broader trends like tariffs caused by the US-China trade war. Worried Chinese investors asked Hikvision whether any “measures to maintain the stability of the stock price” were coming. On October 24, Hikvision announced an "increase in our controlling shareholder's stake in the company" after an entity called CETCIH bought about $4m worth of shares and pledged to buy $21m to $42m worth of stock over the next six months. CETCIH exists mainly to "strengthen market value" of the CETC's businesses by "making full use of the internal resources of the group company," according to its own website, which also has a specific section devoted to [Communist] "Party building" activities. JRJ, a top Chinese financial media outlet, reported that this was a way for Hikvision’s “family” – i.e. the state-owned CETC – to “maintain” its flagging share price. This share purchase does not change Hikvision's controlling shareholder but sends a signal to investors that the Chinese government is standing behind Hikvision during this downturn. While Hikvision has denied the CETC's influence on its operations, as the DC-based think tank Asia Society recently wrote in a report on Chinese state-owned enterprises, “investors know that the ultimate locus of decision-making is at the group company level, not the listed company level”. In Hikvision's case, the "group company" level would be the CETC, while the "listed company" is Hikvision. Christopher Balding, a professor at Fulbright University in Vietnam and China economy expert, said via email that such purchases were "relatively standard operating procedure" during "stressful periods in the market." However, Balding said that while such measures may work "as a way to prop up the stock", in the long run "it is absolutely not sustainable" due to already high levels of Chinese government spending on the economy. 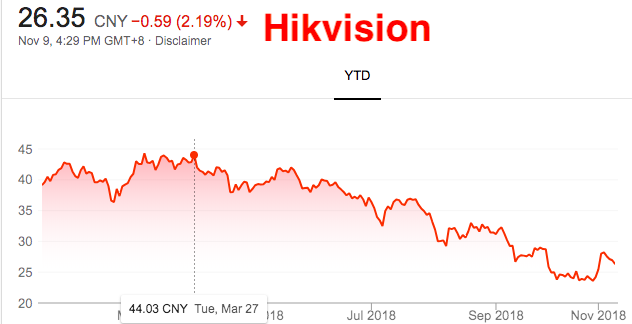 The Chinese government's move to directly support Hikvision's stock is only the latest way that the company has benefited from the Chinese government, something Hikvision's overseas leadership has denied but has been admitted to elsewhere. In a 2016 bond prospectus, Hikvision listed "strong support from PRC government and our state-owned parent" as a "competitive strength." The firm also touted "substantial fiscal subsidies" and free land from the government. (Hikvision: Chinese Government "Exert Significant Influence Over Our Business"). The benefits of the Chinese government’s support to Hikvision are obvious. It shows that the Chinese government stands by Hikvision when turmoil hits the markets. It also gives Hikvision a strong advantage domestically, given that its closest rival Dahua is a private company. Dahua has not received the level of direct government support – like outright share buying from a state-owned parent company – as Hikvision. 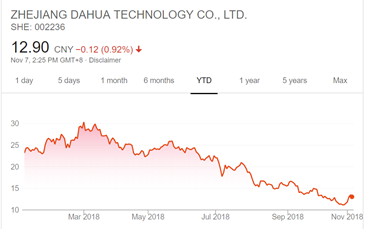 That’s partly why Dahua’s stock price has crashed even harder this year than Hikvision’s, falling by almost 60% from a high of 30 yuan ($4.33) to around 13 yuan ($1.88). However, continued and increasing Chinese government ownership has risks. Global scrutiny of Hikvision over possible espionage and human rights is increasing, particularly due to its Chinese state backing. Global media and governments have focused on Hikvision's government ownership as a potential national security issue. This contributed to the US government banning federal purchases of Hikvision equipment and the Australian military's promise to remove all Hikvision cameras on its bases. Meanwhile, Dahua has no qualms about promoting the fact that it is not China government-owned, in an attempt to shake off concerns over its products. (Dahua Ban Response: NOT China Government Owned). It remains to be seen if the Chinese government's strategy will pay off for Hikvision. On the one hand, having a powerful, authoritarian government on your side can help during difficult times. On the other, increased Chinese government ownership will heighten concerns over government influence at a time of unprecedented scrutiny.